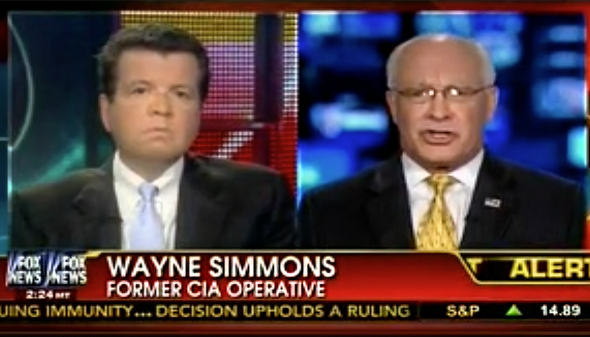 Wayne Simmons, indicted Fox News terrorism "expert," had bold opinions on ISIS and other things. Fox News anchor Neil Cavuto, left, and recurring guest Wayne Simmons on the May 2, 2013, edition of Your World With Neil Cavuto. Simmons falsely claimed he worked as an “Outside Paramilitary Special Operations Officer” for the Central Intelligence Agency (CIA) from 1973 to 2000, and used that false claim in an attempt to obtain government security clearances and work as a defense contractor, including at one point successfully getting deployed overseas as an intelligence advisor to senior military personnel. According to the indictment, Simmons also falsely claimed on national security forms that his prior arrests and criminal convictions were directly related to his supposed intelligence work for the CIA, and that he had previously held a top secret security clearance. The indictment also alleges that Simmons defrauded an individual victim out of approximately $125,000 in connection with a bogus real estate investment. Valerie Jarrett, who many of us believe is running the White House, clearly has no idea what she is doing. Sadly, we have the—we have the capability. We could end this in a week. And that’s not an exaggeration. That’s not hyperbole. We could run a number of sorties, thousands of sorties, locate, identify and designate absolutely decimate ISIS, ISIL, I.S., whatever you want to call them. They would all be dead. And it is so hopeless. It is so sad. Many of us … we’re just so disillusioned. And we have had enough. We don’t know what to do. We don’t know if we can make to it the next election. And hopefully we get someone in that has the—the determination to destroy ISIS. Until [Europeans] get rid of those no-go zones—you go in and you [put] razor wires around those no-go zones, you turn off the water, and then as they come out, you catalogue them. And that is how you close these no-go zones. Unfortunately, it seems that Simmons’ plans to eliminate ISIS and close the no-go zones will have to be put on hold.